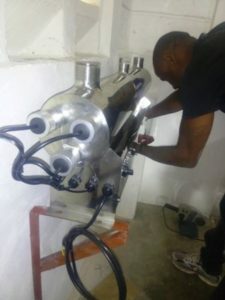 Our technician fixing the new model of UV sterilizer. We want the best for our fish and the best for our customers! On this note,we are replacing our UV sterilizer with a newer model as time has taken his tribute. We know that every investment in quality will pay back, or at least doubled. 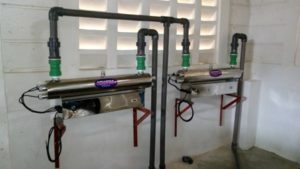 This kind of sterilizer is ideal for our large commercial aquarium so that we can maintain the water and fish quality. The specially designed lamps disinfect faster and have greater cell penetration capability. The compact body design has a small footprint making it easy to handle, install and maintain. It has vipers which are engineered to accommodate extreme flow rates of up to 60,000 liter which is equivalent to 16,000 gallons of water so as to control disease in fish and maintain the levels of planktons in the tanks. A flow switch, provided, shuts the unit off automatically to balance the flows. 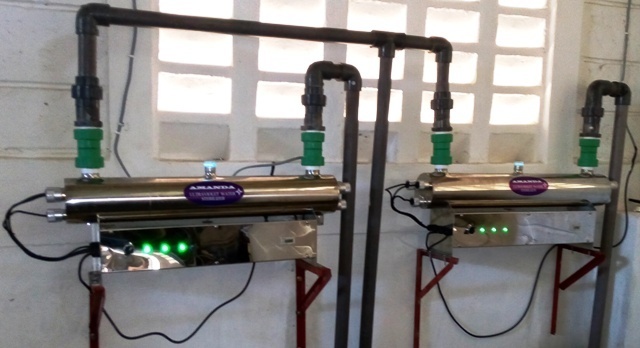 UV Sterilizers are being used by public aquariums, importers and hobbyists alike to control bacteria, protozoa and parasites, reducing the spread of fish disease. In a confined environment like an aquarium UV and filtration are essential. The UV Sterilizer is a proven method to eradicate bacteria, viruses and protozoa. At Kenya marine center we can now be sure after upgrading and replacing our UV sterilizer, we are guaranteed of disinfected water, algae elimination, fungal and parasites as well as bacteria control. This is going to help us maintain our quality fish delivery to the customers and continue being the best exporters of marine ornamental fish as well as invertebrates. The lights are on and Kenya marine center has a new UV sterilizer! Kenya is a developing nation which has its challenges of growth. 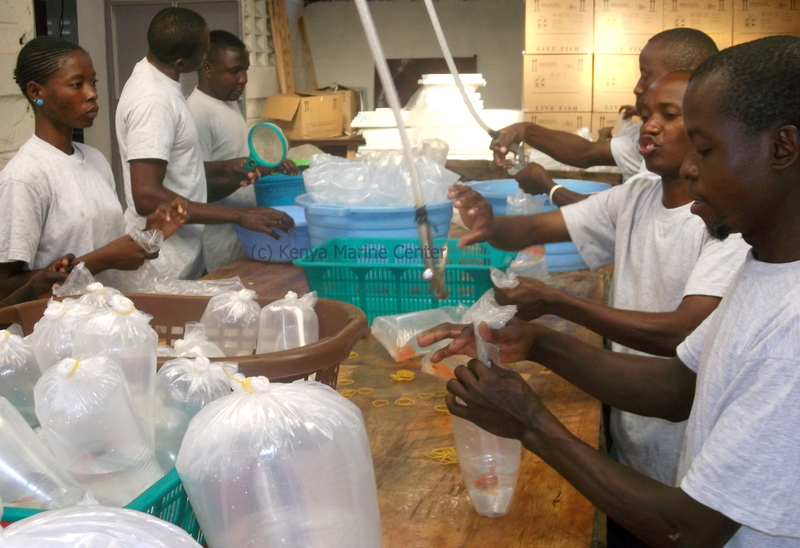 In the coastal region of Kenya where most ornamental fish trade takes place, infrastructure is quite a challenge. Therefore as KMC, there was need for an all weather (road) fish trucks that takes the fishermen to different fishing points to ensure a good catch which is both good to the export station and its fishermen. A good truck must carry all the needed fishing equipment. Some of the equipment required is good holding bags and oxygen cylinders to pump air to the fish in their containment bags while in transit. Modern fishing boats equipped with an out boat engine are used to ferry the fishermen to their selected fishing points. Kenya marine center preferred these boats as they can sustain the weather and currents of the ocean without endangering the lives of their fishermen. Over the years, in the evolution of the fishing industry different methods of catching fish have been discovered that are less tiring and more efficient. These methods have been found to be destructive to the environment and most hobbyists complain of the inferior quality of fish. 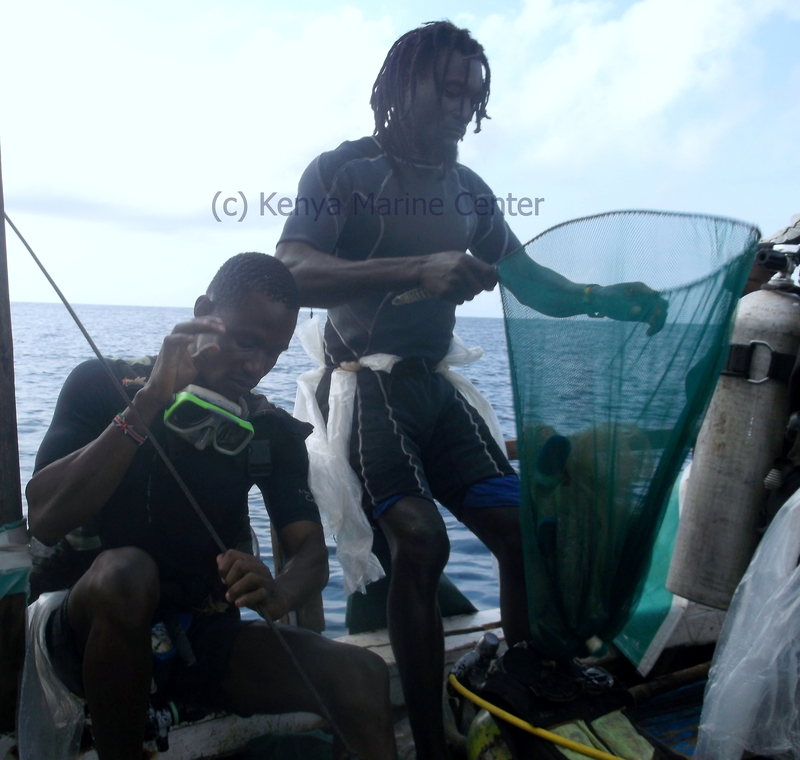 At Kenya Marine Center, we insist in the quality of hard work and fish are hand net caught. 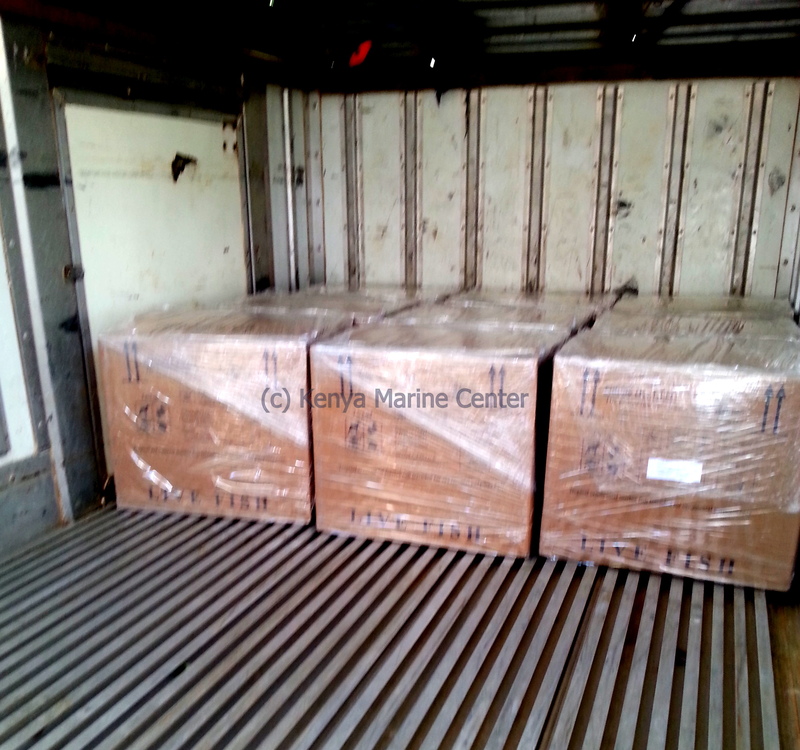 Kenya Marine Center Packing fish for transit. The fishermen poke at the caves where the fish hide to scare them towards a waiting barrier net before rushing to scoop them up using hand scoop nets. This method is most popular and quite tiresome but the extra effort protects the ocean reserves and preserves the fish natural habitat. Attention is not only given to the method of catching fish. 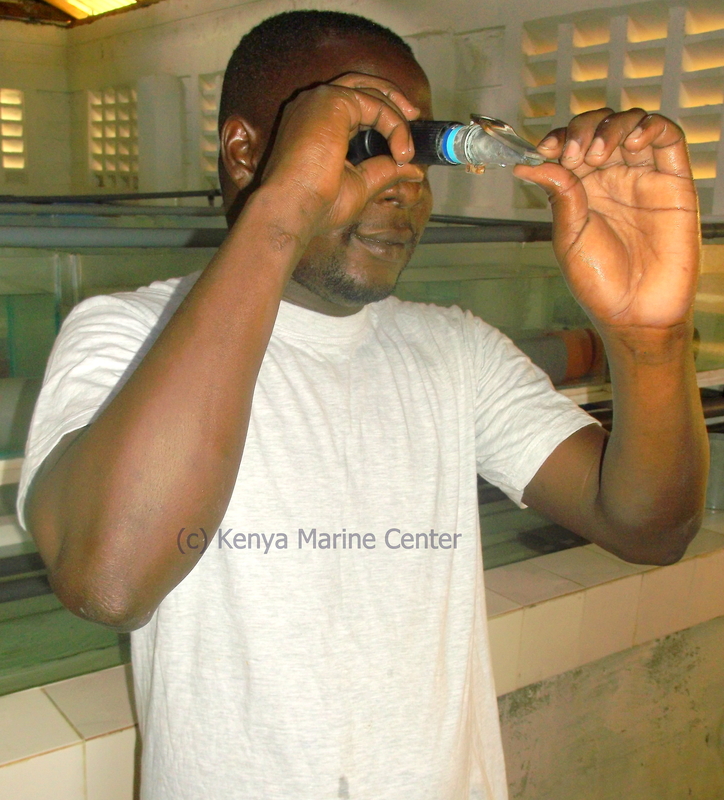 Kenya Marine Center as a company prides in supplying healthy fish. Long term professional employees who are knowledgeable in a wide range of fish and can give proper care to them at an individual capacity, monitor the fish and the state they are in. This is made possible by investing in modern facilities and use of modern technology. At this point bookings for shipment are already confirmed and the packing staffs are tasked to provide comfort for the fish to endure an entire flight. Each fish has its own method of packing, special boxes will be used as fish differ in size and nature. 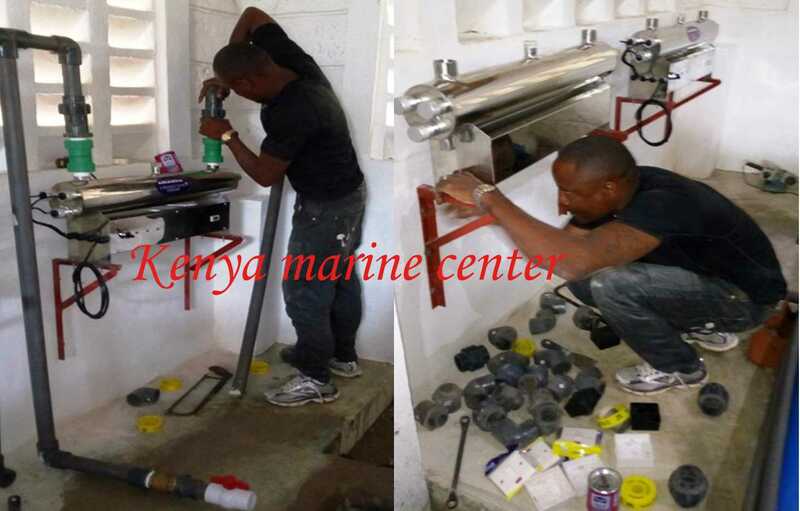 Through experience Kenya Marine Center has valued the importance of working of long term employees as we found their experience to be invaluable. The most important part in every shipment however, is meeting standard health measures as regulated by the Kenyan government. KMC administrators link with government health inspectors (veterinaries) to verify and certify the condition of the fish before they leave to their different destinations. The administrators also link with airport officials to book flights that will guarantee the speedy delivery of the fish with limited to zero interference. Success of every export station lies in the number of positive feedback. Kenya Marine Center has achieved this through efficiency and a race against time in every stage.